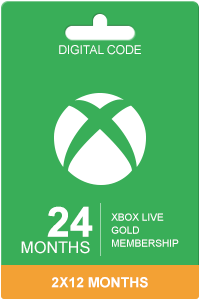 Xbox live 6 month membership. This product is a digital code, Once bought, the code will be sent to your email or can be downloaded directly from your pc screen. These downloadable codes are original codes and are produced by the developer. These codes have no expiry date. The 180 day Xbox live membership is one of our most popular products. Having an active Xbox Live subscription does indeed come with lot of advantages. How much is Xbox Live Gold 6 Month Membership? Keep in mind trying to find the cheapest 6 month xbox live gold membership can lead to some trouble as many sellers online carry stolen or illegitimate gold subscriptions. 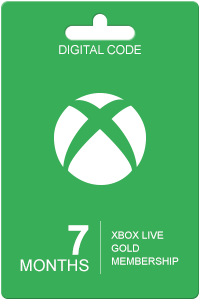 Our Xbox Live Gold codes are 100% legit (you can check our FAQs) and some of the Cheapest half year Xbox Live Gold available in the market. Our prices are low because we buy in bulk allowing us to offer discounted Xbox Live Codes and special Xbox Live deals. With our Xbox Live Gold 6 months you will enjoy 180 days of the advantages and the unique possibilities of Xbox Live. Because we deliver the code digitally and directly in your email, you will immediately be able to redeem your live code. Our Xbox live Gold subscriptions will work for both Xbox 360 and Xbox One users. Find Xbox live gold 6 months cheapest subscriptions at Livecards.eu. With Xbox live gold subscription you have access to unique discounts and possibilities, especially if you own a Xbox One. If you don't have a Xbox One, Xbox Live Gold still offers enough advantages. You will get exclusive discounts on games that can be up to 75%! Every month you will be able to download free selected games. This helps you save big! If you want to order Xbox Live Gold 6 months, you will need to fill in your personal information and choose your payment method. How to buy Xbox Live Gold 6 months? 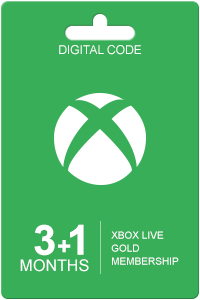 Buying Xbox Live Gold 6 months from Livecards.eu is as easy as 1 2 3! Simply fill in your email address, select a payment method and complete the payment! We have some of the cheapest Xbox Live Gold 6 months on the market. Welcome to Livecards.eu the place to be if you're looking for digital codes! You will find almost everything you need for PlayStation, Xbox and PC. We sell software packages that you can purchase easily with digital code for both Macs and PCs. A prime example of our products is Microsoft Windows 10 Home (64-bit OEM). Windows 10 is so familiar and easy to use; you'll feel like an expert. The Start Menu is back in an expanded form, plus Microsoft will bring over your pinned apps and favorites so they're ready and waiting for you. It starts up and resumes quickly, has more built-in security to help keep you safe and is designed to work with software and hardware you already have. Microsoft Windows 10 Home (64-bit OEM) comes with Microsoft Edge, an all-new browser that's built to give you a better web experience. Write or type notes directly on webpages and share them with others, read online articles free of distraction and save your favorite reads for later access. With Cortana enabled, you get instant access to key actions — like making reservations or reading reviews — without leaving the page you're on. Easily snap up to four apps in place and see all open tasks in a single view. You can even create virtual desktops when you need more space or want to group things by project. Get it faster than you can boot up your computer with our 3-step ordering system! First choose the product you want to purchase, then choose which payment method, and lastly... make the payment! It's so fast and easy! You'll have your code in seconds on your screen and sent to your e-mail address at the same time.